In case you’ve been living under a rock, let me give you a little recap. The Hunger Games is a super popular book trilogy that was recently (as all successful book releases eventually are) adapted into a movie trilogy. The first film, The Hunger Games, came out in March and killed the box office. If you’re like me, you might have read the books each about 3 times and seen the movie twice in theaters. And you’ve probably been counting down the days until The Hunger Games is released on DVD (Hint: it’s this Saturday, August 18). 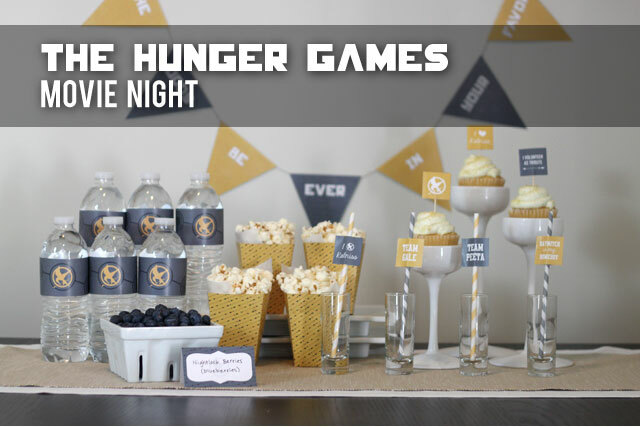 But whether you’re a huge Hunger Games fan, or watching the movie for the first time, you should definitely make this film the center of your next movie night. Invite a few friends over, pop some popcorn and settle in on the sofa. To help you out, here’s some super cute free printables for your party! 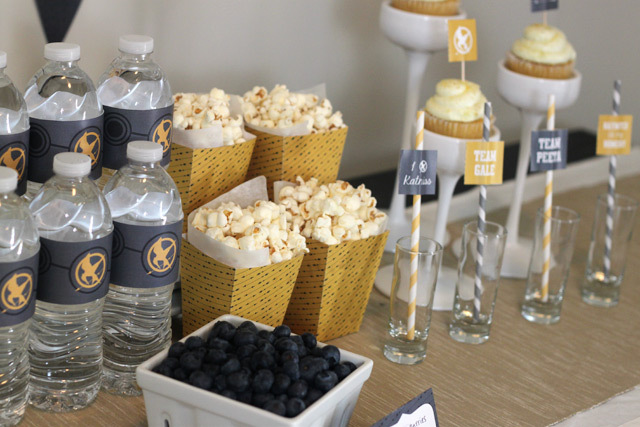 There’s an editable invitation (just open it up in Adobe Reader to change the date, time and address of your own soiree), bunting, water bottle labels, place cards or food labels, straw flags or cupcake toppers and some single-serve popcorn boxes. Almost everything can be put together with just cardstock, scissors and double-stick tape—you’ll need to add some twine or string for the bunting garland, and either straws or toothpicks to make straw flags or cupcake toppers. It’s all free and yours for the taking. If you want to share it with friends on Facebook or Twitter, that would be much appreciated. I just want to spread The Hunger Games love to everyone! Oh, and… may the odds be ever in your favor! You should definitely watch it! Or read the books–Or both! It’s been one of my favorite reads recently. I love this! 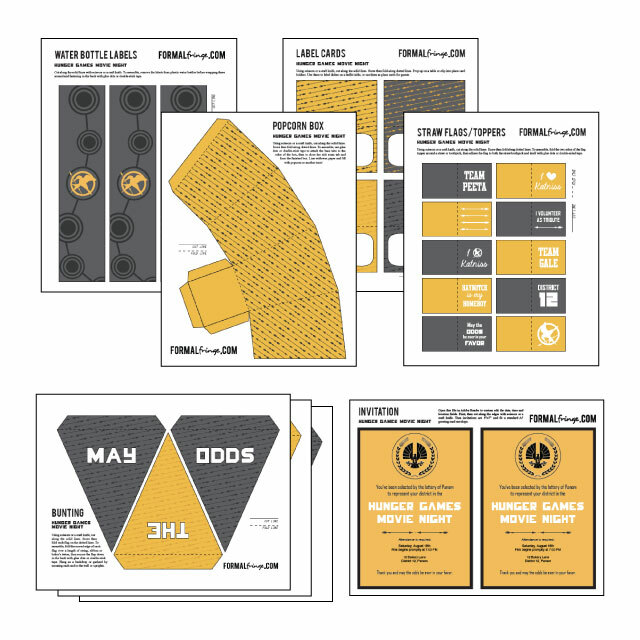 I’m planning an outdoor movie party with a Hunger Games theme, and the printables are exactly what I was looking for. Wow just found your blog via hellocotton, i am blown away, this is amazing! 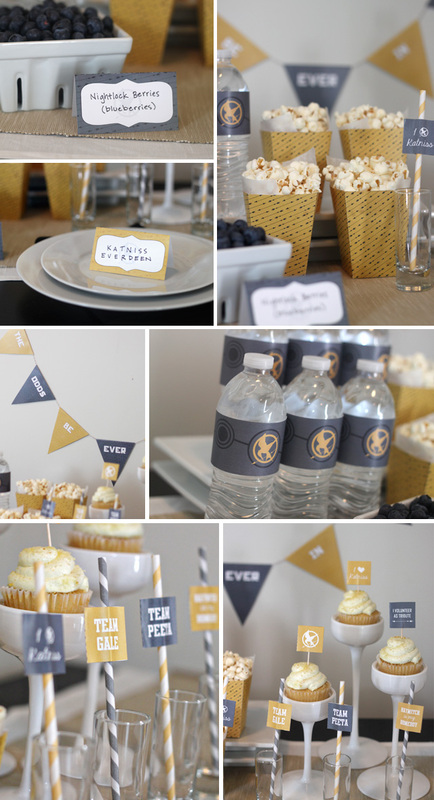 I’m getting ready to have a Hunger Games themed party for my stepdaughter. Thanks so much for all the great printables! I do have one question, though. Where did you get those straws? Thanks again! Awesome thanks fo sharing, my grand ddaughtr is in archeryand her 12th birthday party will have this theme! I love it! I’ve been searching for something like this for my daughter’s birthday. 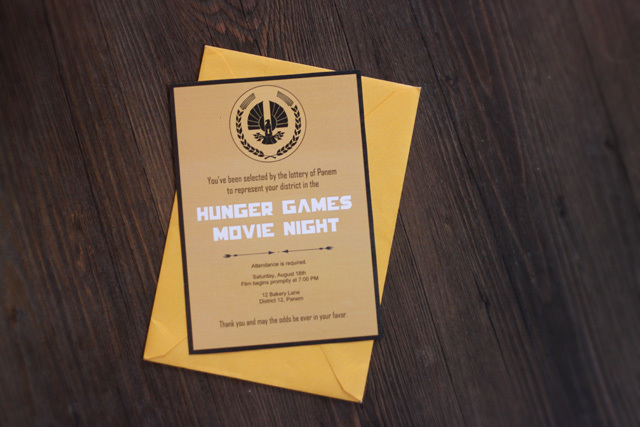 Is there any way I can get (download/purchase) the Hunger Games Font? I want to edit it to include my daughter’s name, but I don’t have that font.